This is it, guys! I really want to make the final two books a reality, so I’ve begun one last Kickstarter to help make that happen! If even the initial goal is reached, Volume Two and Three will come jam-packed with 200+ comics apiece plus bonus goodies, and be available in both paperback and hardcover! Perhaps most importantly, about 90% of these books will only be available through Kickstarter! If/when they release in May, I won’t have the comic being updated like it is now, so ordering too many new items at this point is foolish. There’ll be a few books that go on sale then, but I imagine that they’ll run out quickly. Long story short, I highly recommend you get these through the tiers if you want ’em! There it is! AAAAAH! 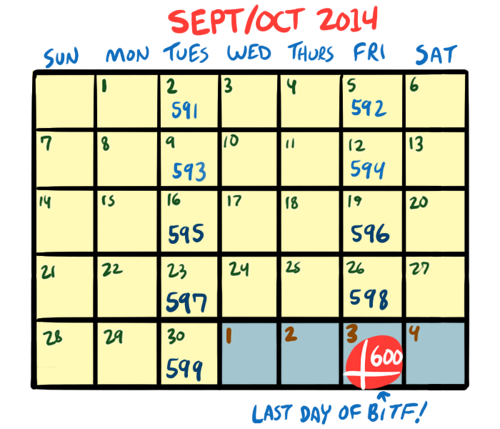 As many of you speculated, BitF will indeed be ending at a solid 600 strips. The Monk fan in me wouldn’t have it any other way (which means no 601, naturally)! The crazy thing is that the day that Brawl in the Family ends is the same day that the new Super Smash Bros. for 3DS will come out. How apropos, huh? I actually didn’t plan it that way, but it’s strangely poetic. And still so bittersweet. Alright, enough doom and gloom for now. Go jump on those Kickstarter goodies so we can put this whole webcomic into book form! I want to make this happen!